"One of those tomato-based dishes that gets even better after a day or two in the fridge," writes Jessica Elliott Dennison in her beautiful new cookbook Salad Feasts. 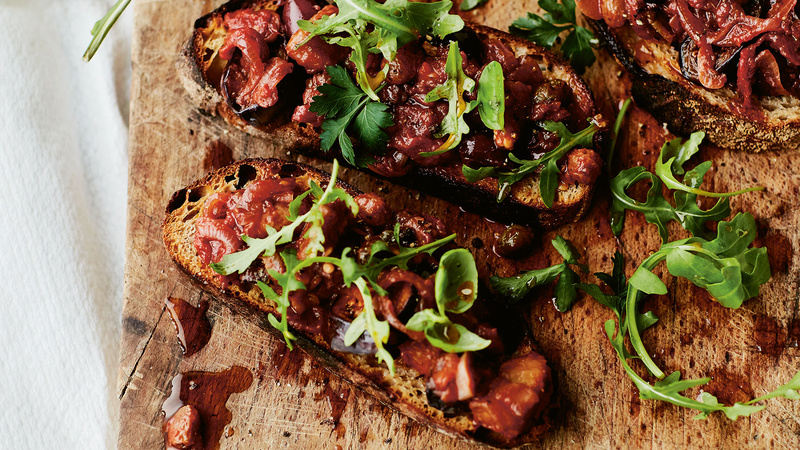 "This is my take on a Sicilian caponata. The method for this salad is so simple, you can't go wrong. All I would say is it pays to take the time to really brown the aubergines, allowing them to pick up nice colour and go silky soft in the centre. Smooshed onto some hot toast and topped with lemon-dressed rocket, this is so, so good." First, heat a large frying pan (skillet) over a high heat while you cut the aubergines into large chunks (roughly 2.5 cm). Add most of the oil to the pan along with the aubergine chunks and cook for 5-6 minutes until golden and beginning to darken on all sides. Meanwhile, peel and halve the onion then slice into thin half-moons. Peel the garlic and slice into thin slivers. Add the remaining oil to the aubergine pan and reduce the heat to low then fry the onion for 3 minutes until beginning to soften. Add the garlic and cook for a further 2 minutes (taking care to not burn the garlic). When you're ready to serve, wash the rocket in a basin of cold water (this will freshen and crispen the leaves), pat dry and place in a large mixing bowl. Tear in the herbs (discard the stalks), squeeze over the lemon and gently toss. To assemble, toast the bread then divide between four plates or a large serving board, as pictured. Smear over the aubergines then top with the lemony rocket.